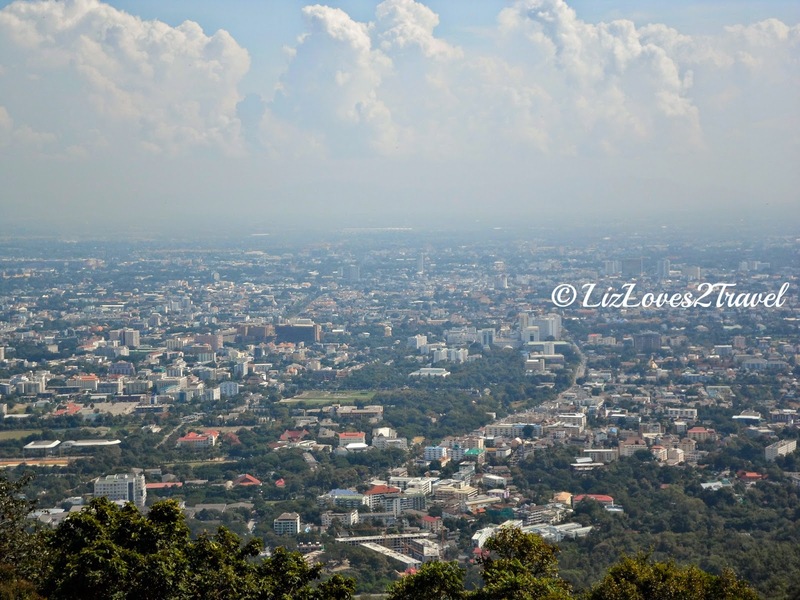 Chiang Mai is mix of a modern and historic city. Even though it's becoming increasingly modern as the years go by, you can easily tell that it is Thailand's most culturally significant city in the North. 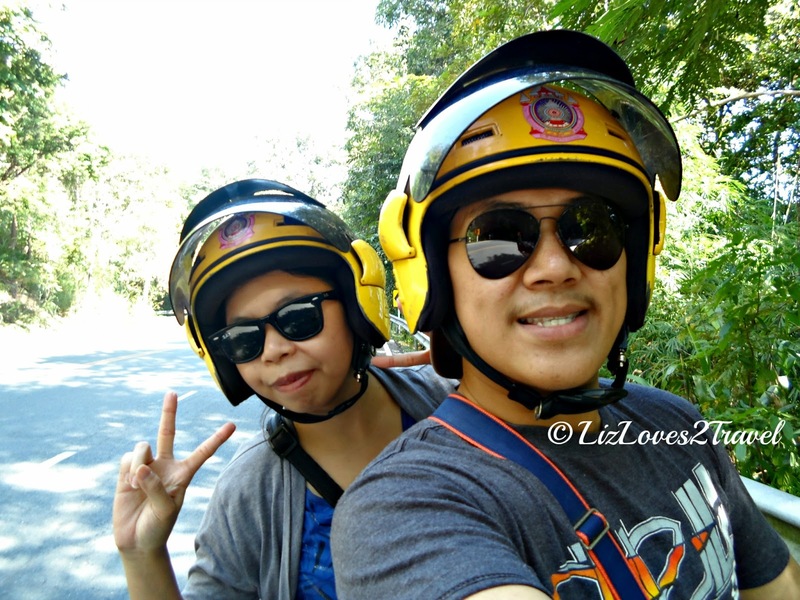 We planned to see the city in a motorbike. It was the most reasonable way for us two and we loved the fact that we can freely go anywhere we want at anytime. Mama Pat, our lovely guesthouse owner helped us in arranging our motorbike rental during our entire stay. 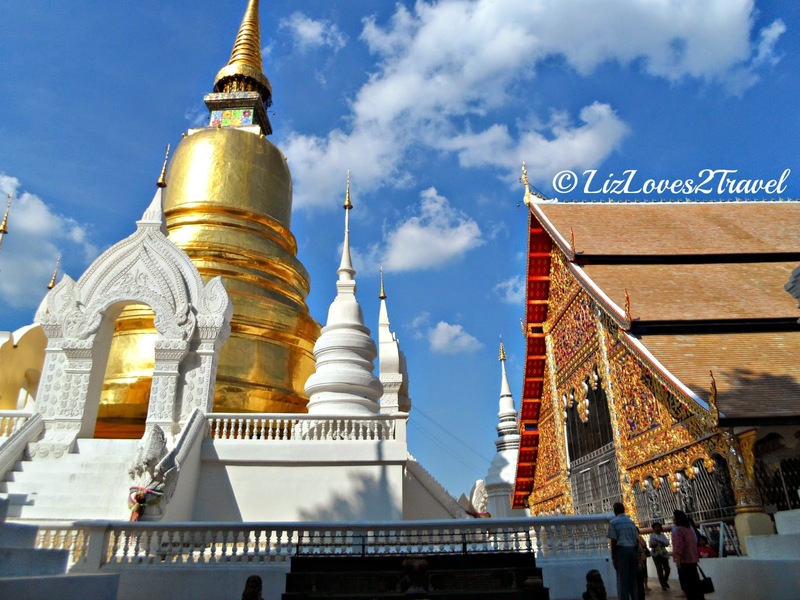 When you're in Chiang Mai, temples would be a major part of your itinerary. Especially if you're interested about architecture, ancient structures or simply curious about their culture and religion. There are more than 300 Buddhist temples around the city, but I'll just show you those that I think worth seeing and easily accessible from the city center. 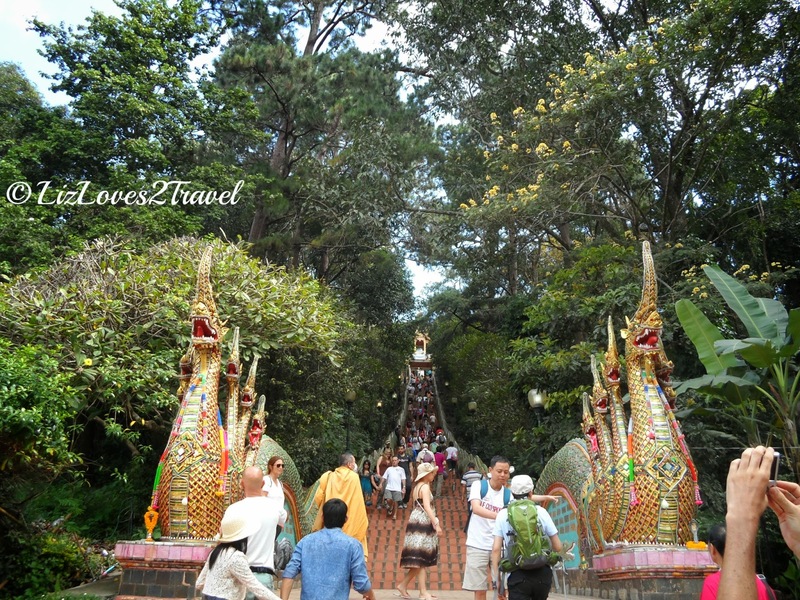 The first on our list was the Wat Phra That which is situated near the top of Doi Suthep (Mount Suthep). It was a nice 15-km drive going up to the mountain.You will notice the wind getting extra cold, the higher you go. Before making it to the temple, you'll pass by the viewing deck where you will see a panoramic vista of the city (Picture #2) and a small waterfall on the side way (Picture #4). Phra That means Buddha relic. It refers to Buddha's shoulder bone which was said to be carried here by a mystical white elephant, hence the King ordered the construction of the temple at this site. It was a sight to behold. The architecture, the intricate details of everything, the huge terrace and the view from this mountain top - all amazing. 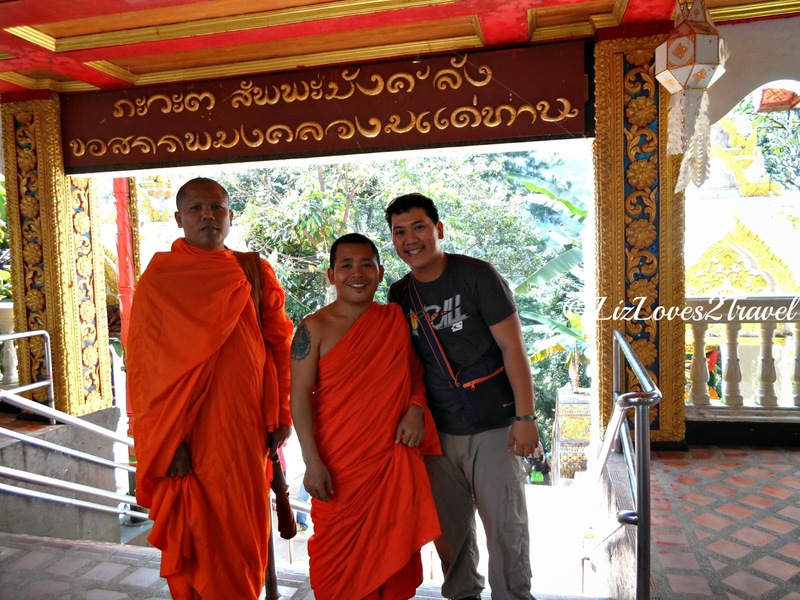 This gorgeous temple was built in 1383 along with a Buddhist monastery which still houses monks to this day. The donations and the elevator fees being collected is being used for maintaining the temple and to support the monks living there. 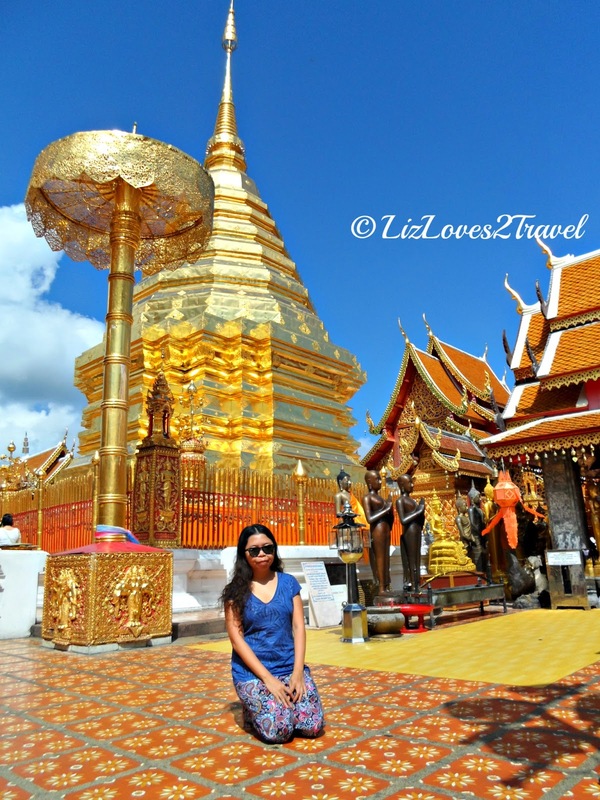 For me, it is one of the most beautiful temples I've visited in Thailand. 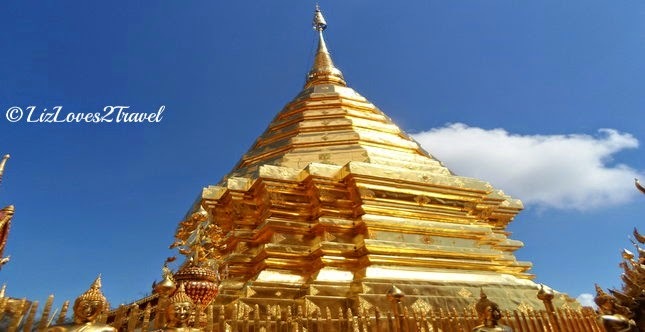 It has every right to be the most famous temple in Chiang Mai. You can also find here this stunning Emerald Buddha replica. 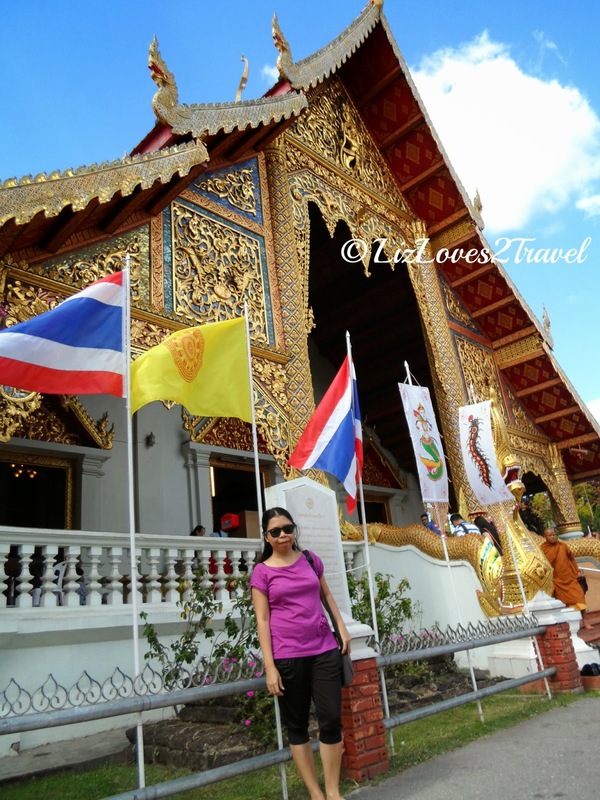 The original one is now in Bangkok, in Wat Phra Kaew at the grounds of the Grand Palace. 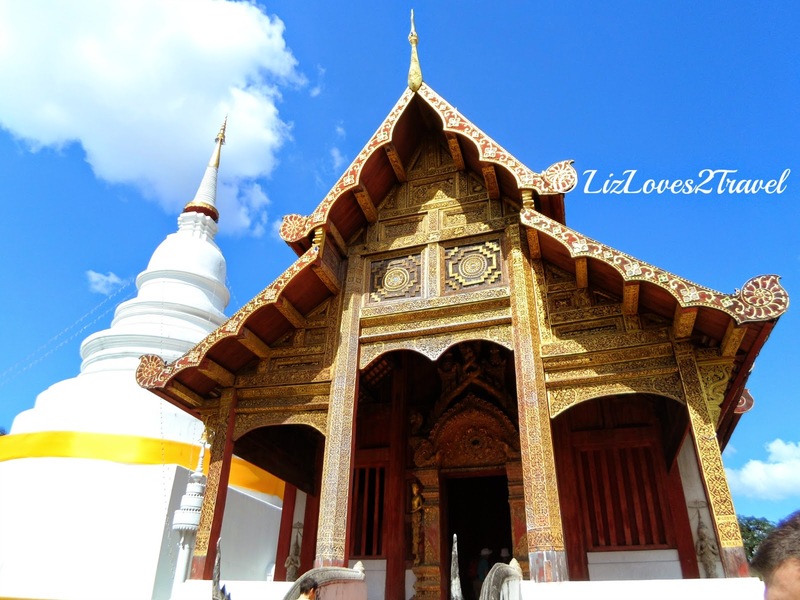 Here's a historical temple in Chiang Mai. 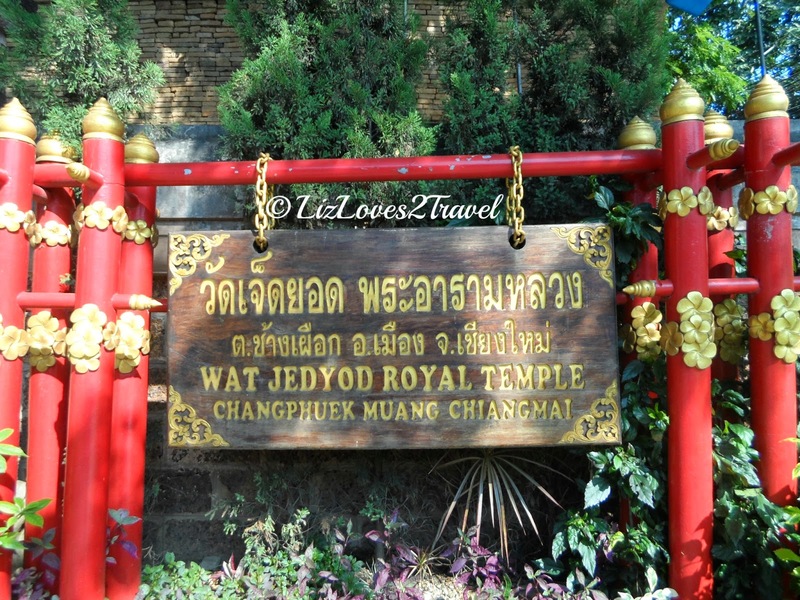 Wat Jed Yod is also sometimes spelled as Wat Chet Yot (both are correct). It is a little distant from the walled city but located near one of the major highways, so it's still accessible. 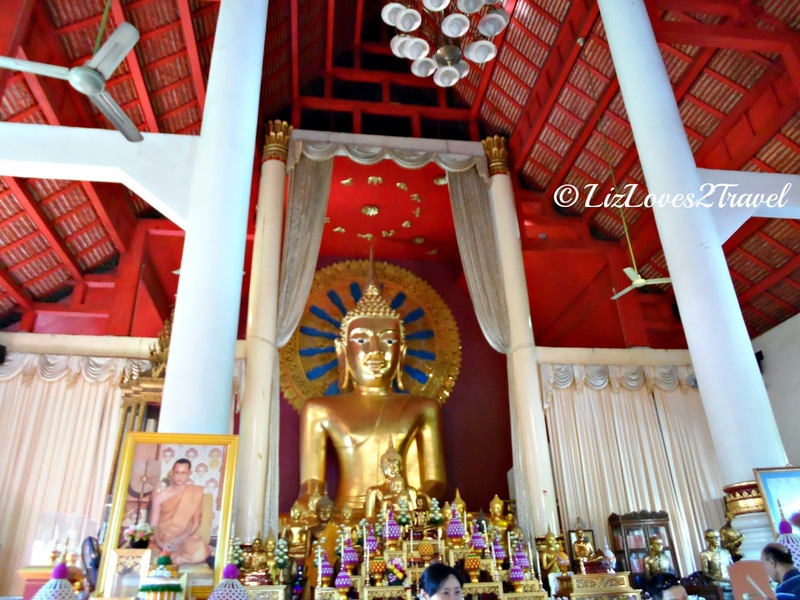 Unlike the Wat Phra That, it barely had visitors. There were just one or two other tourists when we visited. We really appreciated the silence and the solemnity of the place. Jed Yod means "seven spires" which the main shrine has. This picture below reminded me so much of the facade of the Mahabodhi Temple in Bagan, Myanmar. Upon further reading, I found out that the King who established this temple had sent his monks to Bagan where the first Mahabodhi Temple replica is and based the building of this temple from that one. Both temples were patterned to the original Mahabodhi Temple at Bodhgaya in India. 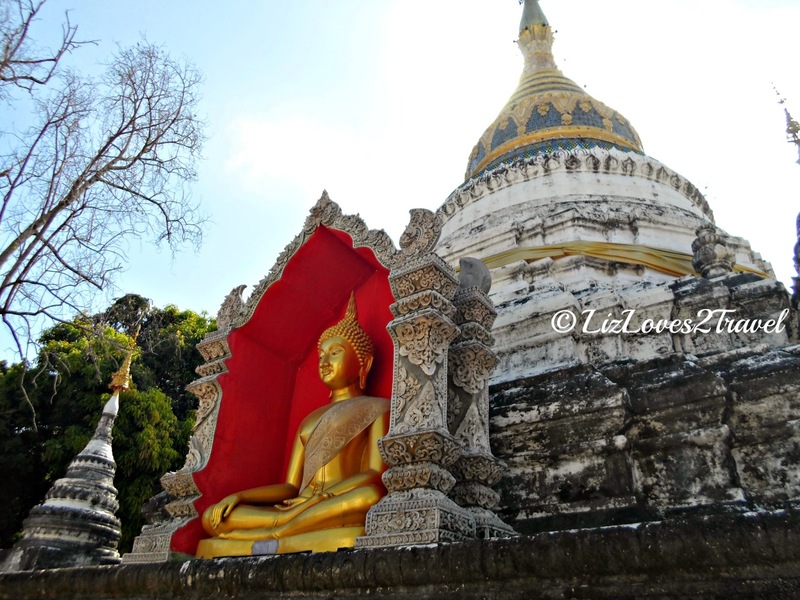 This one in Chiang Mai is built honoring Buddha's 2000th year of enlightenment dating back to 15th century. The rectangular wall of the main pagoda has 70 weathered bas reliefs. Some of them were already partially damaged but others still intact. Among the temples I visited in Thailand, this is quite unique. It looks more similar to the temples of Bagan (in Burma) than those in the rest of Thailand. 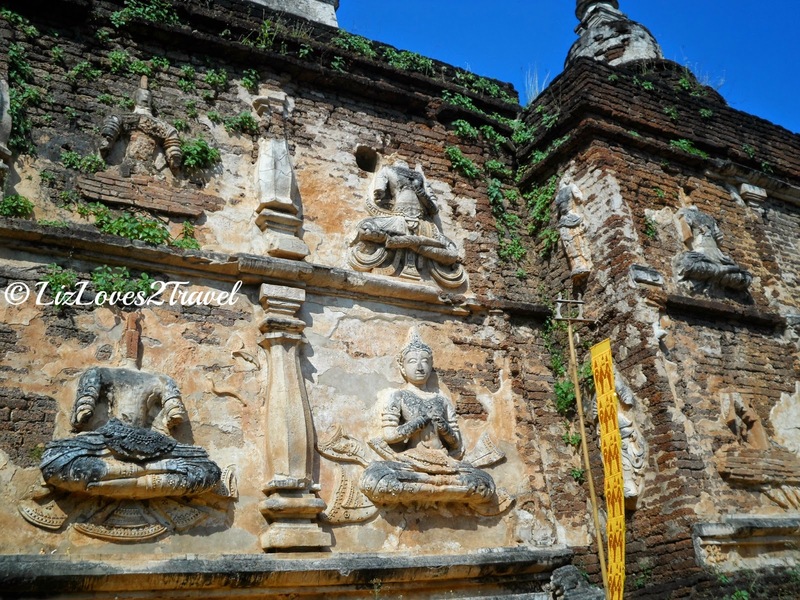 Located at the west side of the old city walls is this 14th century temple called Wat Suan Dok. 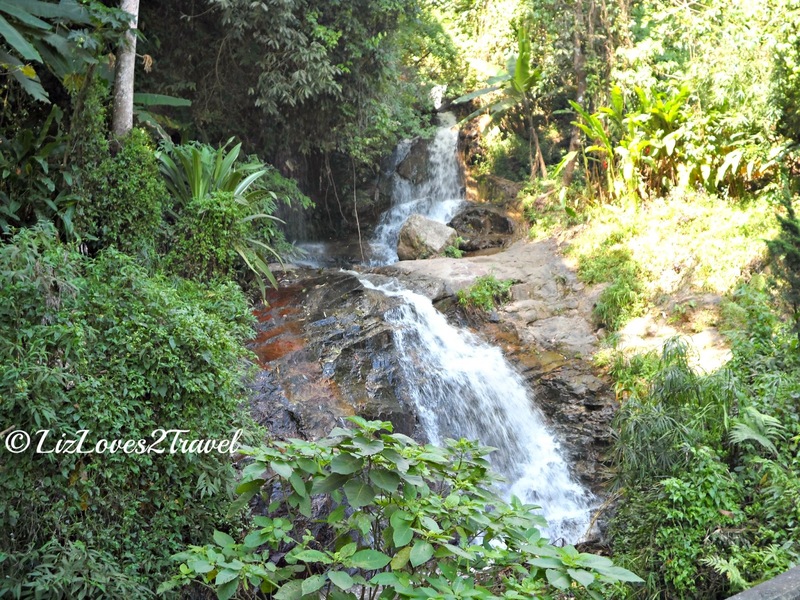 It is just along Suthep Rd., so we easily found it after our decent from Doi Suthep. Suan Dok literally translates to flower garden, but I didn't see any garden nor fields of flowers anywhere in site. Aside from the big chedis, this temple also has white-washed mausoleums in the northeastern part of the temple grounds. 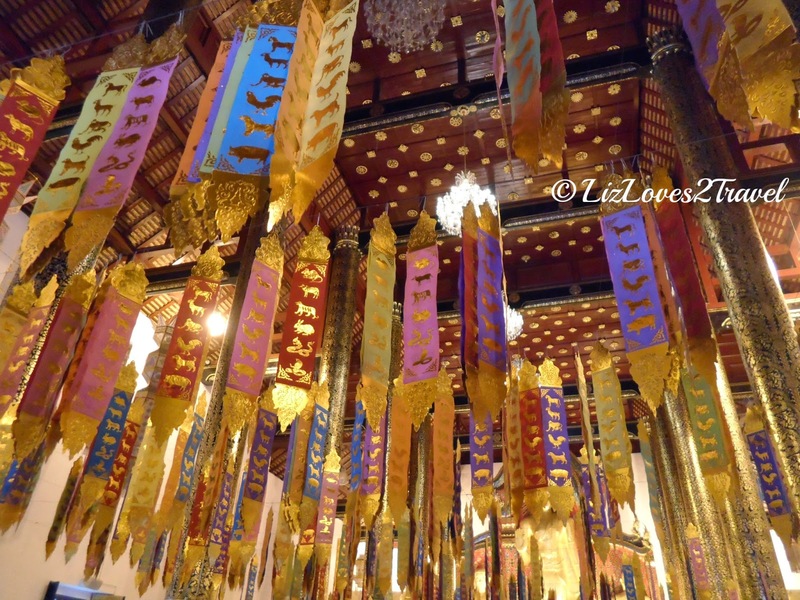 It is where the cremated remains of Chiang Mai's past rulers and royal family members lie. I wasn't able to take photos of it because there was an ongoing restoration that time. On the photo above, it's that area on the left side covered with green net fences. 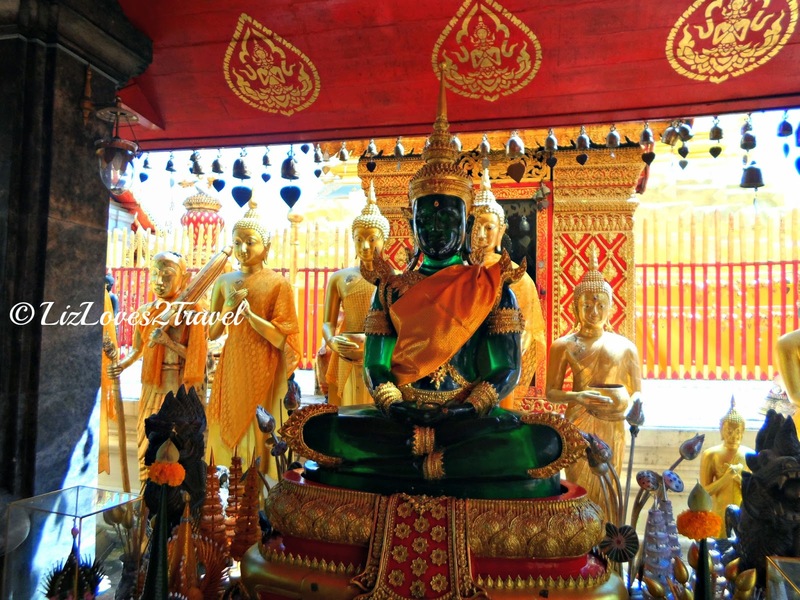 According to the legend, the relic stored here was the original half of the one that was housed in Wat Phra That. Adding to the unique attributes of this temple is its colorful sala kan parian (sometimes also referred to as wiharn*). 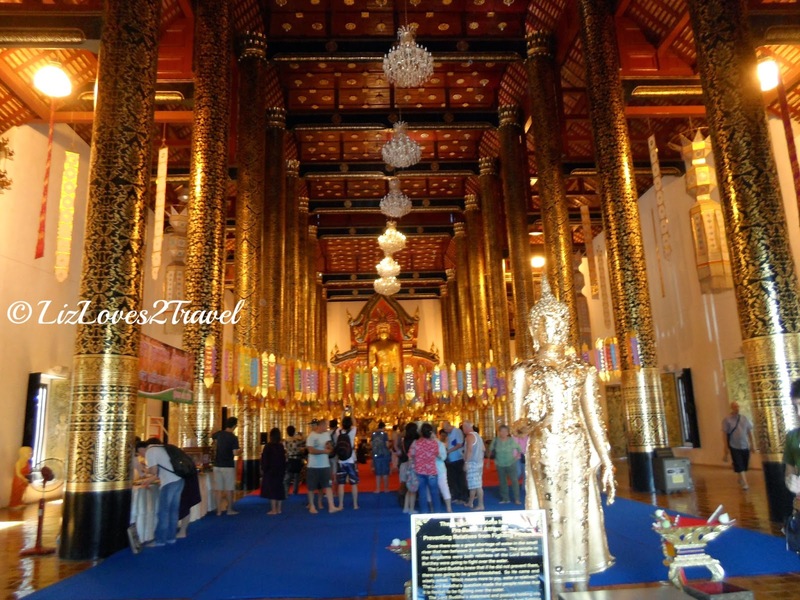 It is usually the largest and most prominent building in a wat (temple) where they enshrine Buddha images. Not only that it is huge but it is also open on all sides which is quite uncommon. This pavilion also functions as a place where monks can perform ceremonies and clerics can teach lay people the Buddhist doctrine. I loved the interior of this shrine. The colors and details of the ceiling and the columns were fascinating. 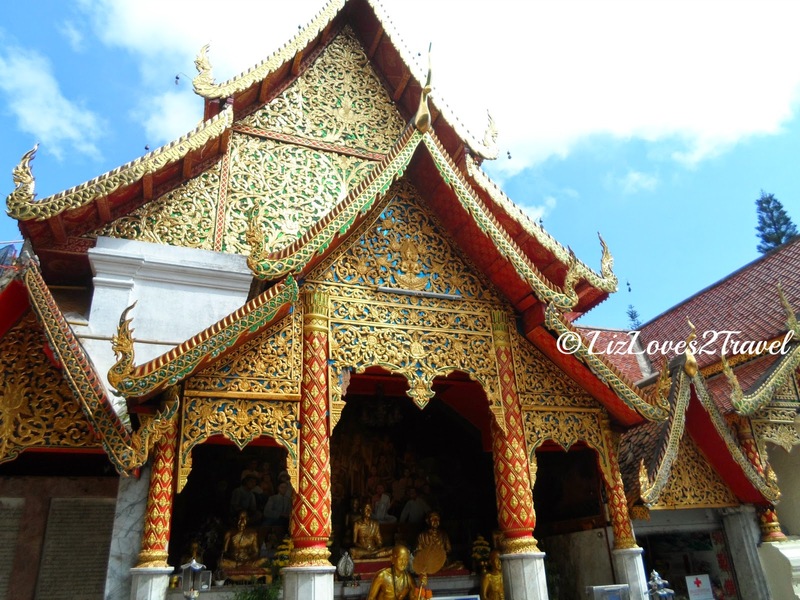 Trivia: Wat Buppharam is the old name of the temple I just featured before this, the Wat Suan Dok. And there are more temples in different locations (Bangkok, Trat and Penang) which has the same name up to now. Confusing eh? 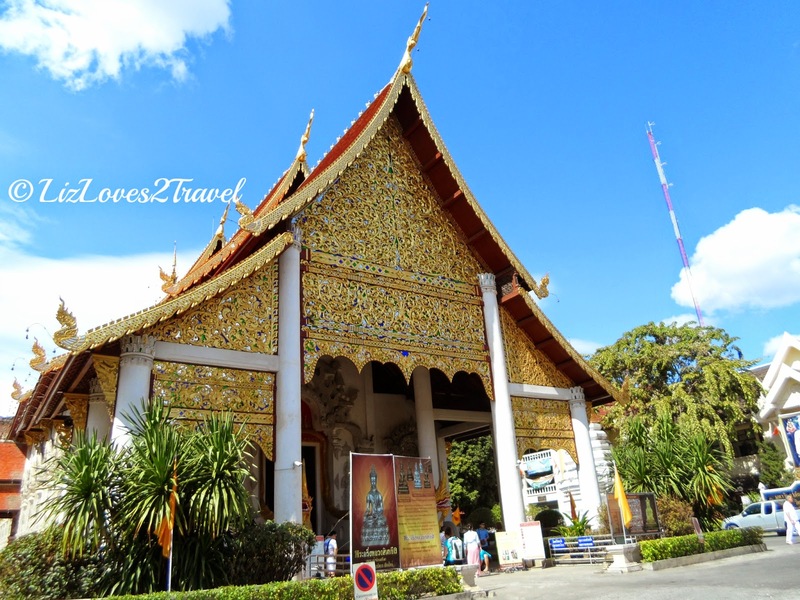 Wat Buppharam is located south of Tha Phae Rd., not too far from the walled city. 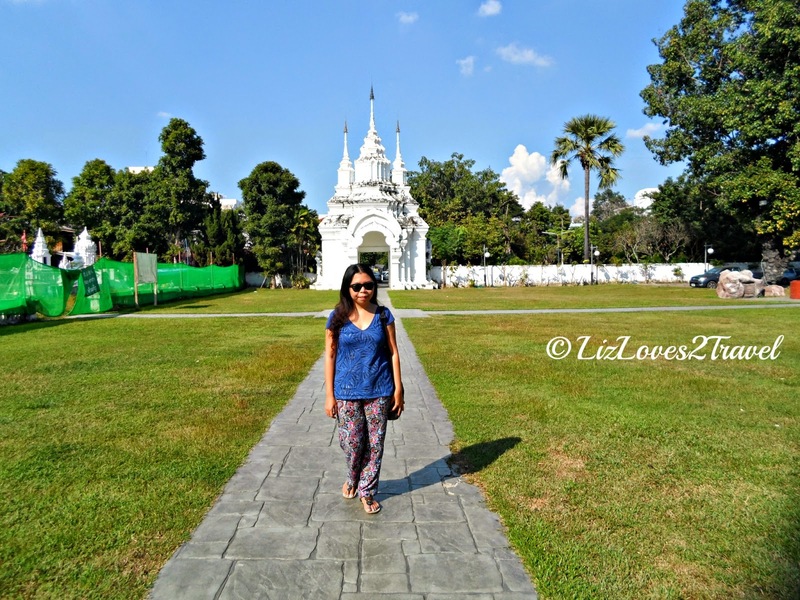 This site is historically significant as this was where Prince Kawila took back Chiang Mai from the Burmese after 200 years. The Dhamma Hall is the most prominent structure in this temple complex. The construction of this hall took 10 years to finish. 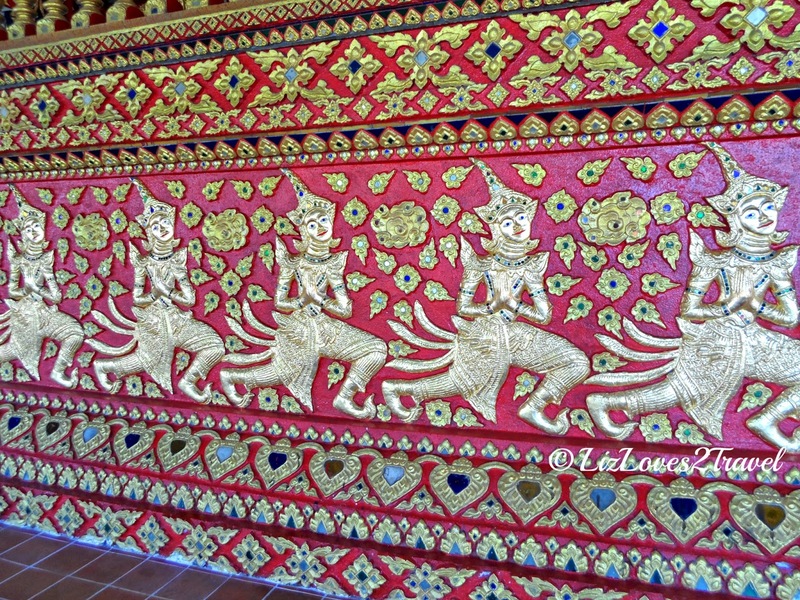 It is also different among the other temples in Chiang Mai for having a cruciform symmetry. Located in the garden is this white chedi with a golden spire. 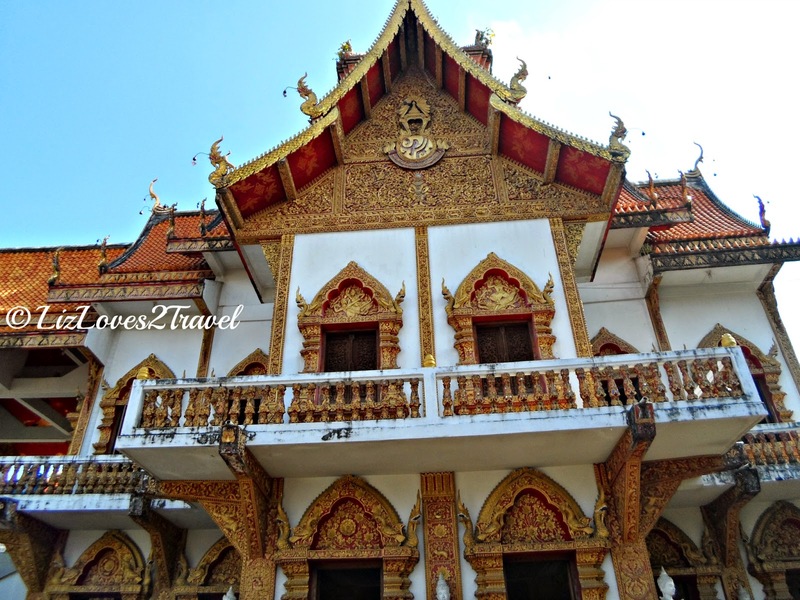 Mon and Burmese architecture is very evident in this 400-year old structure. The base of this chedi has Buddha images in all four sides. 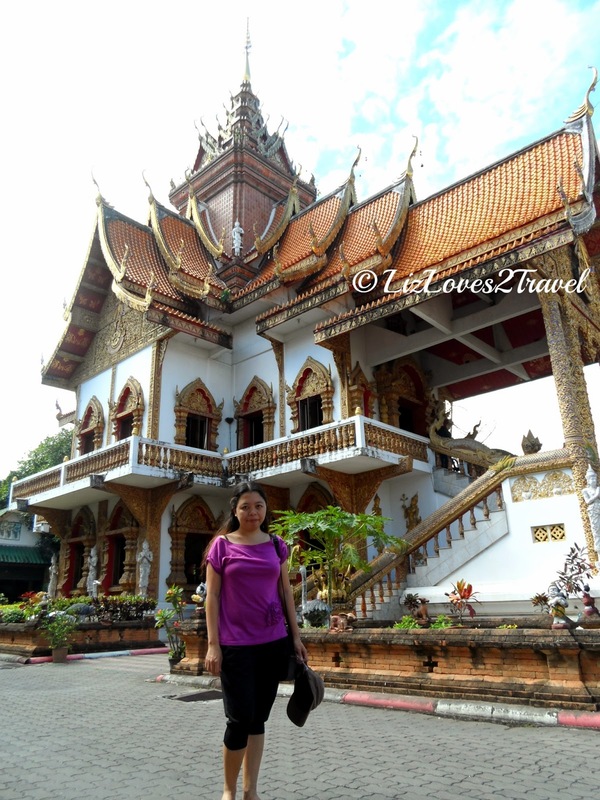 Located inside the historic walled city of Chiang Mai is this temple, which name literally means temple of the big stupa. 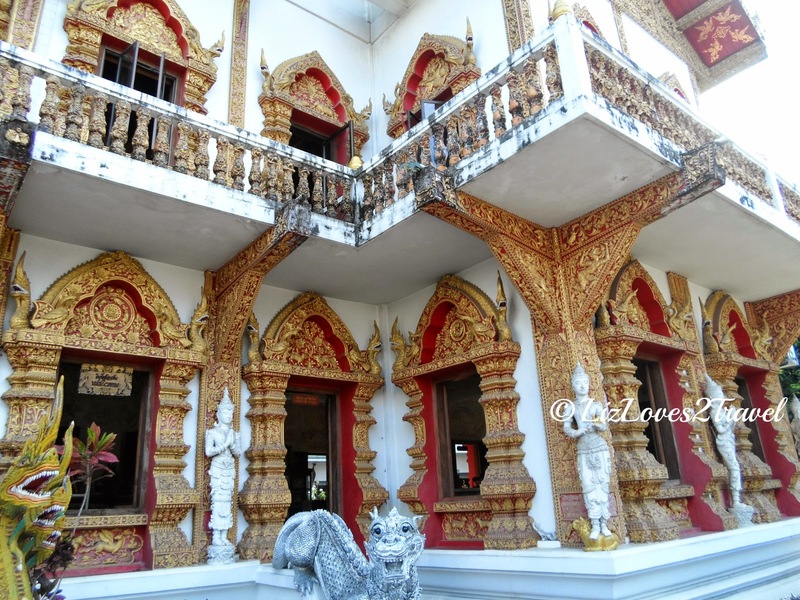 Upon arriving, the first thing that we saw was this notable three-tiered roof wiharn with white columns and golden exterior. It has a very high ceiling and the color dominant inside is also gold. The Buddha in front of the shrine is in standing position. When we were there, an old lady was selling this colored ribbons with zodiac symbols in it. Or maybe that was what I assumed hehe. We tried to ask the lady about it but she only speaks Thai. As the saying goes, "When in Rome, do as the Romans do". So, we observed the locals and we followed what they were doing. We chose the ribbon which has our zodiac symbol, write our prayers and wishes on it and hung them up there. I was hoping we did it right! I'm not sure if its always like that in this temple or if it was just for the Loy Krathong occasion. Here in this temple, there are also monks who can pray for you. You may just give a donation before or after he blesses you. 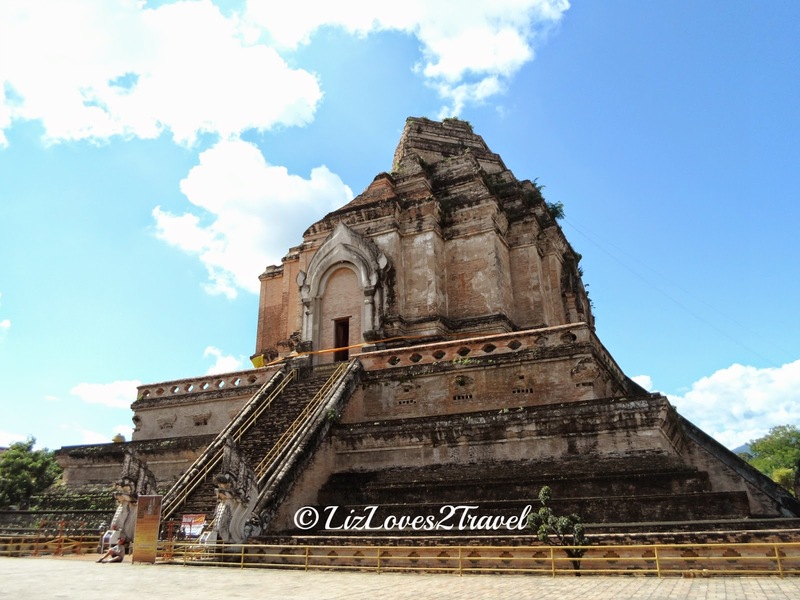 Behind the main wiharn is this enormous brick chedi where the temple was named after. It was partially ruined by an earthquake. Believe or not, construction of this chedi took 84 years! 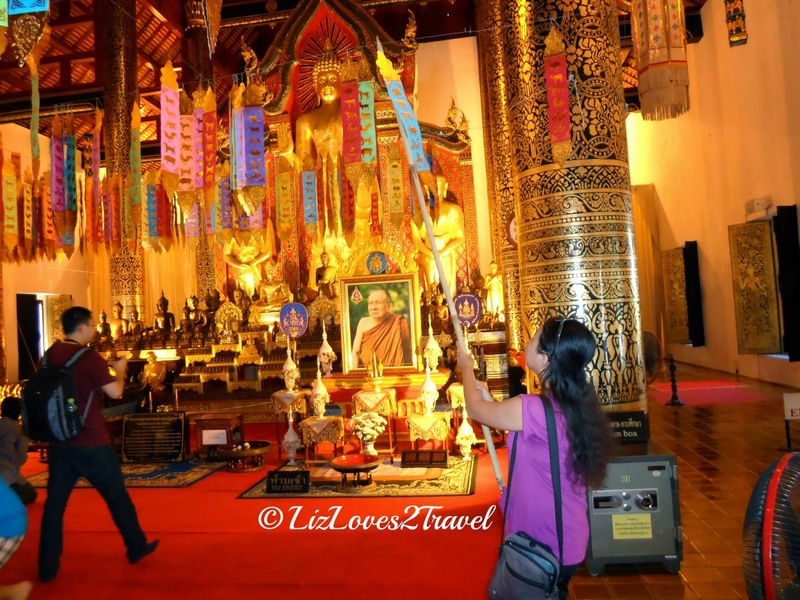 The most valuable Buddha image in Thailand, the Emerald Buddha was installed here back in 1468. After almost a century, it was moved to Luang Prabang in Laos and now it is in Bangkok (as I've mentioned in my Doi Suthep feature above). It is now closed to the public so we didn't get to look at it intently. We weren't looking for this anymore when we found it. 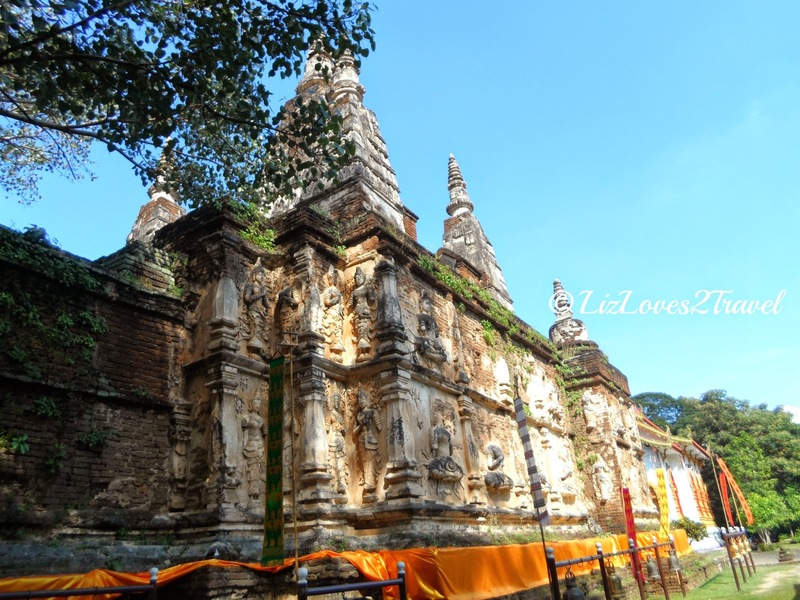 This 14th century wat is one of the most appealing temples inside the walled city. 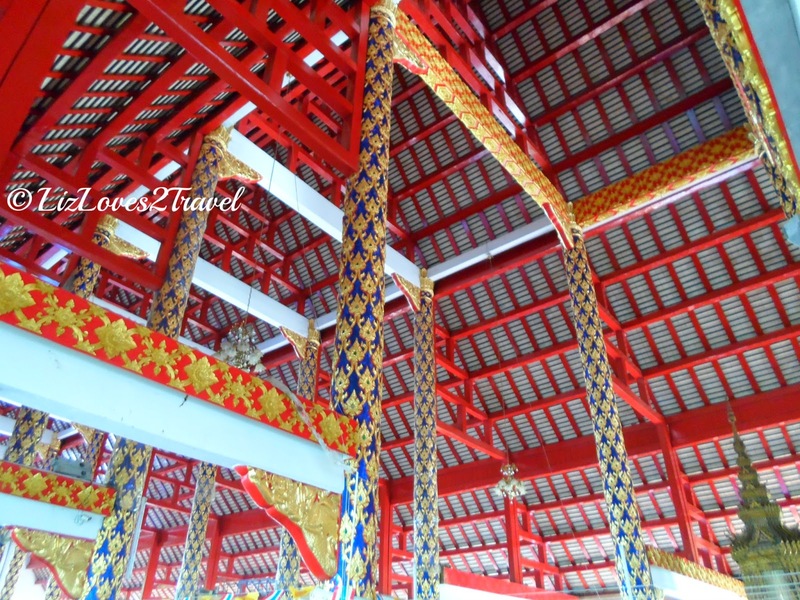 The interior of the wiharn luang has three aisles with its red high ceiling being supported by white columns. 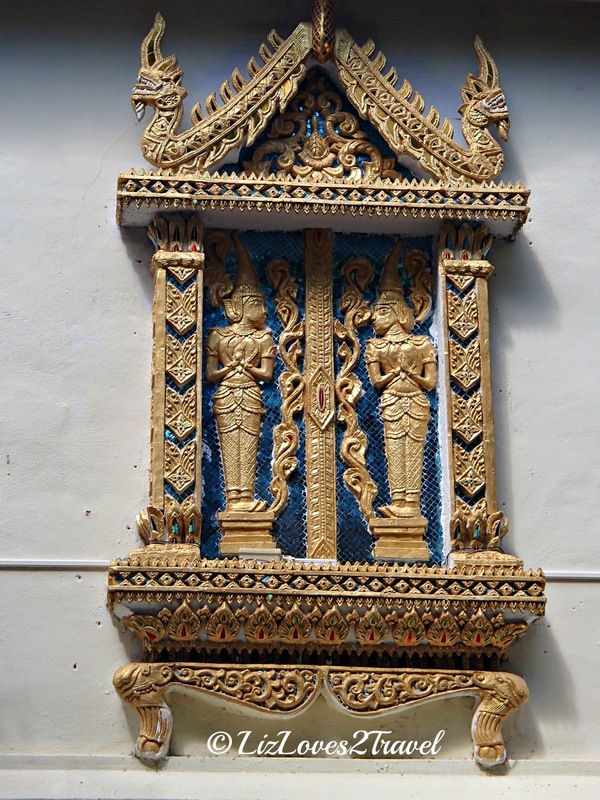 It is a classic example of Lanna architecture. 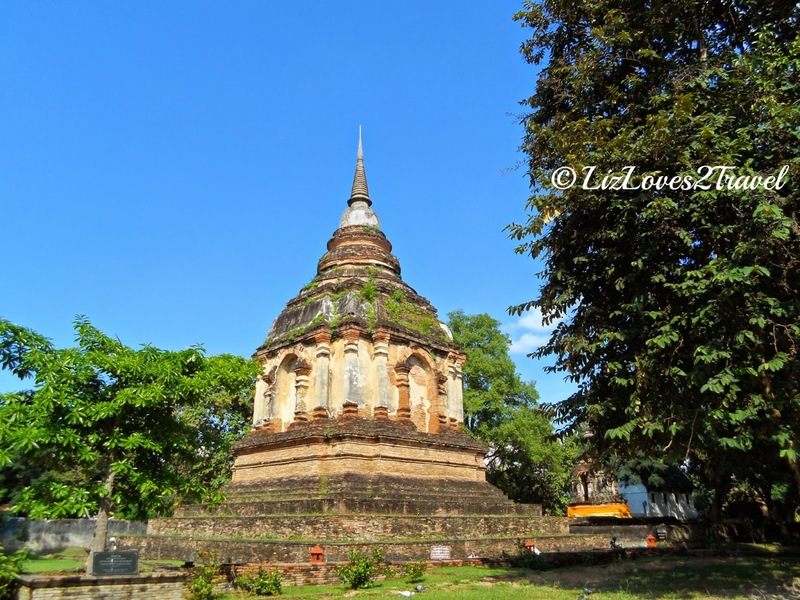 The oldest structure in Wat Phra Singh is also its main chedi. It is five-tiered, circular in shape but has a square base. 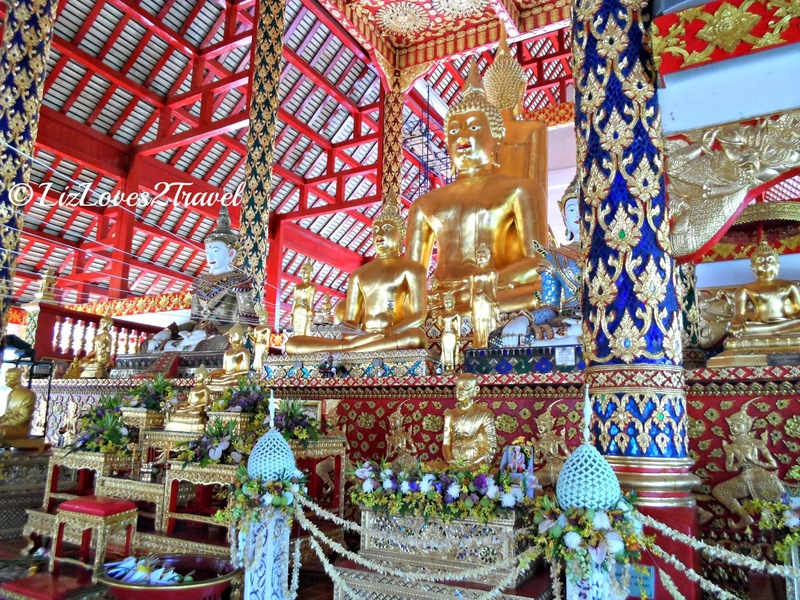 Unlike the other wats' chedis, this was built not to enshrine a Buddha relic but the remains of a King. 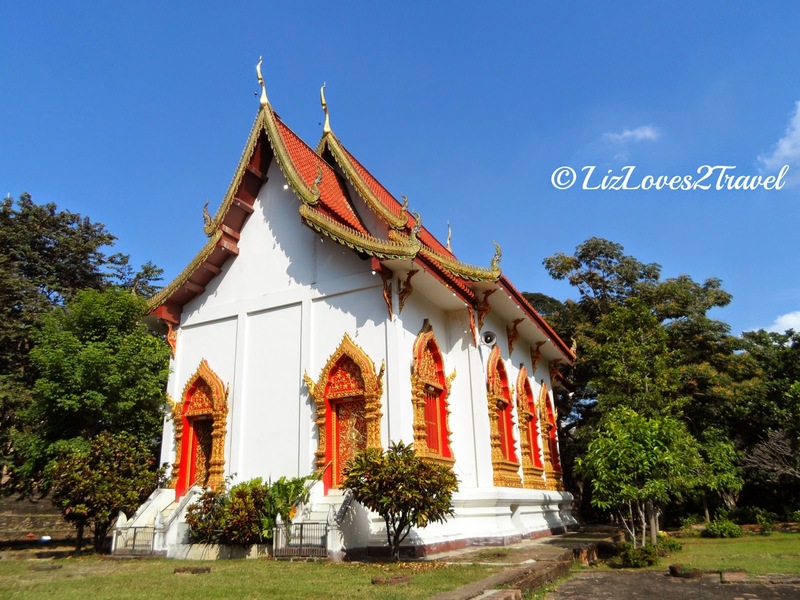 The ubosot*was the latest addition to this temple complex only built in 1806. Its fancy decoration added more charm to the already attractive temple. This structure is known to be used by monks and nuns. *For an elaborate definition and deeper understanding of Thai terms for places of worship, you may refer to this link. 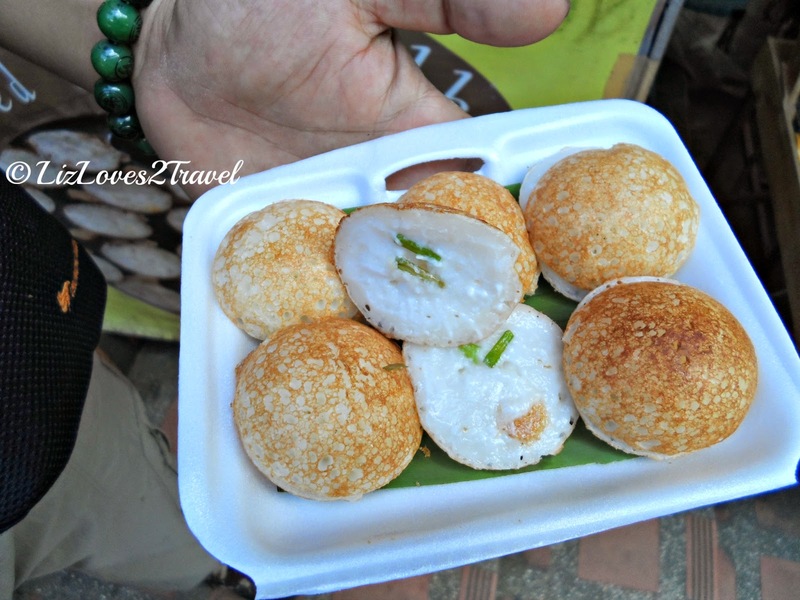 This is Part 7 of my Chiang Mai travel series.